Chapter 4 looks at Collaboration 1.0, or working face-to-face with a focus on content rather than the interaction between people. Some of the characteristics of Web 2.0 and Web 3.0 (Semantic Web) are also explored. In chapter 5 on Collaboration 2.0 we look at how the collaboration environment has changed today, and examine some of the characteristics of Web 2.0. Chapter 6 called Collaboration 2.5 looks at avatars, virtual worlds and 3D collaborative environments The chapter ends by looking at collaboration in social networks and how they interact with virtual worlds. The technology is only as good as the people communicating within it. In part II of the book we shift from examining the aspects of process and technology into the critical components of interpersonal communication. In Chapter 8 we look at an overview of some of the fundamental components of interpersonal communication and some of the challenges they bring up. In Chapter 9 we move onto the critical tools and level of awareness essential to building an effective communication toolbox that can be used within any technology pathway. Chapter 13 is about creating shared vision and a pathway to desired results embodied in Agreements for Results. It introduces the 10 Essential Elements of these agreements, and explains how critical it is to spend the time at the beginning of projects getting clear about desired results, pathway to them, promises of who will do what, metrics and concerns or fears about moving forward. Chapter 14 introduces the steps of The Cycle of Resolution which provides an efficient, effective conversational model that will get you back on track when conflicts develop. Chapter 15 provides the key ingredients and steps for implementing collaborative technology as part of your organizational operating system which serves as an example of how to apply the technologies and interpersonal techniques that were discussed earlier in the book. Chapter 16, the final chapter in the book, is an effective summary, our conclusions and a peek into the future. You Should Read This Book If you use any type of collaboration technology from IM/Chat to a virtual team space. The book is most beneficial for teams, groups, departments, cross-organizational teams and distributed organizations that are looking at some of the Web 2.0 technologies focused on communication, collaboration and interaction. The Authors' Goals are to help you grasp the full array of tools available. This is to allow for effective choices tp be made based on the best vehicles for the context, capacity, physical organization, desired outcomes and purposes of the collaboration. We want our readers to develop competence and capacity as conscious communicators and collaborative process designers. "Information technology is ushering in a new era of human interactivity, one in which people around the world will be able to communicate in unprecedented ways. However, humans are just as complicated on both sides of a fiber optic cable as they are sitting together at a negotiating table. This book is an invaluable guide to this new era, marrying the technological savvy of David Coleman with the human insights of Stewart Levine. I recommend it to anyone curious about the new capabilities Web 2.0 is opening for human interaction and the ways we can use them to help us collaborate more effectively." "'Collaboration 2.0' is your secret weapon for successfully bringing people together in ways that maximize learning, communication and results. The critical tools and insights will transform your organization and unleash innovation. Change it anyway you want!" "Collaboration 2.0 raises some important issues and challenges us to rethink human communication at the intersection of people, process, and technology. Increasingly people are using technology to connect up our best thinking, encourage new relationships, and stimulate innovative problem-solving that transcends culture and global boundaries, indeed making the world increasingly flat . I particularly like the introduction at the end to the role collaboration will play in helping us take on the challenges of envisioning a sustainable world that serves the needs of all people and ensures stewardship for the planet. It's time to have meaningful, courageous conversations on a scale not yet imagined that will help us create and live in the dream of a sustainable world." Debra M. Amidon, Founder and CEO, ENTOVATION International Ltd.
"As the world gets 'flatter' and national boundaries become increasingly meaningless, legal and business professionals need new tools and techniques for global collaboration. Coleman and Levine have been working these fields for decades and offer real solutions for these virtual problems. If you are a legal or business professional who needs to work with an extended team spread across multiple time zones, this book is essential reading." John C. Tredennick, CEO and Founder of Catalyst Repository Systems, Inc.
"'Collaboration2.0' provides very timely guidance to all business leaders who must help their employees learn to communicate well and negotiate projects effectively, and provide team members with the right collaboration tools and technologies." 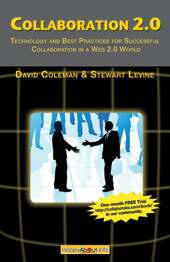 "Finally, a book on collaboration technology by people who actually understand collaboration! It's about time. Thank you David Coleman and Stewart Levine!" "David's had his finger on the collaboration pulse for a long time, helping people make sense of what's going on and how to take advantage of the new developments. It's great to see his new book doing the same with the 2.0 wave of collaboration." "The web is interactive. The world is flat. And now David and Stewart explain why and how collaboration is the next chapter in this evolution of networks." "This is a 'must have' bible for those of us faced with the difficulty of creating effective virtual teams that bring products and services to market faster, even though everyone is separated by time and distance. It balances bringing everyones knowledge of the available technology to the same level while providing insight and prescriptions for solving people and process issues that are critical to successful teamwork. In todays global economy, where project teams everywhere are joining meetings virtually, this book contains the new recipe for creating an effective distributed workforce." "The wealth of technologies and working methods available for teams and organizations can be overwhelming for those who are charged with leading collaborative strategies. But help is at hand. 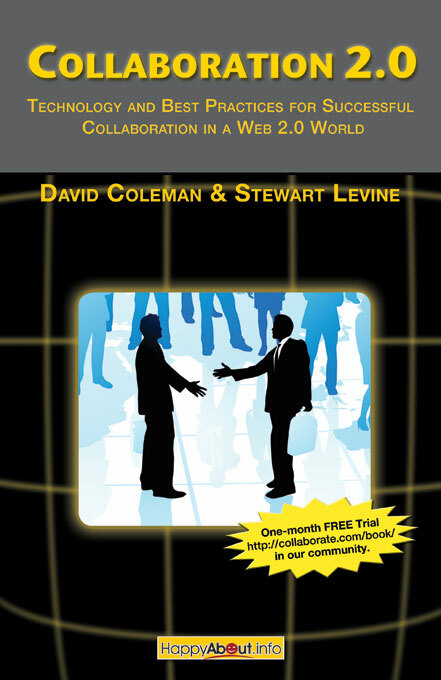 Authors Coleman and Levine guide us through the black hole (or portal) of our familiar business universe into the alternate world of virtual collaboration, 24/7 availability, information flows, and creative partnering." "To me, 'Collaboration 2.0' is a holistic book that should be read by anyone interested in productivity, efficiency, social networking, virtual teams, and dispersed knowledge workers. Your book has application in all fields. This is a book about making teams be more successful. I will refer to it often." David Coleman, Founder and Managing Director of Collaborative Strategies (CS) www.collaborate.com, has been involved with groupware, collaborative technologies, knowledge management (KM), online communities and social networks since 1989. He is a thought leader, frequent public speaker, industry analyst, and author of books and magazine articles on these topics. His comments and analysis are most frequently found in the "Collaboration Blog." He has worked with a wide range of collaboration vendors including IBM/Lotus, Microsoft, Macromedia, Adobe, Intuit, EMC and Oracle, and helped them with strategy, positioning, or demand generation projects. He also works with end-user organizations to help them select collaboration technologies, and most recently working with them on "collaborative consolidation" within the enterprise, building online communities and creating a variety of social networks. David also works with distributed teams (across organizational boundaries) to make them high-performance teams. He can be reached at: davidc@collaborate.com or at (415) 282-9197. Stewart Levine is a "Resolutionary." His innovative work with "Agreements for Results" and his "Cycle of Resolution" are unique. "Getting to Resolution: Turning Conflict into Collaboration" was an Executive Book Club Selection; Featured by Executive Book Summaries; named one of the 30 Best Business Books of1998; and called "a marvelous book" by Dr. Stephen Covey. It has been translated into Russian, Hebrew and Portuguese. "The Book of Agreement" has been endorsed by many thought leaders; called "more practical" than the classic "Getting to Yes;" and named one of the best books of 2003 by CEO Refresher (www.Refresher.com) He consults to many government agencies, fortune 500 company's, professional associations and organizations of all sizes. He teaches communication and collaboration skills for the American Management Association. You can find more in formation about him at www.ResolutionWorks.com. You can reach him at ResolutionWorks@msn.com or 510-777-1166.